When many people think of furry conventions, they think of fursuits with their flashy colors, animal faces, and lots and lots of fur! Whether toony or realistic, fursuits are the most noticeable and vibrant aspects of furry conventions. They are walking, talking (or squeaking) art, most of which costs upwards of thousands of dollars. Plus, they’re downright adorable. But it’s not all fun and games for fursuiters. Between the heat of all the fake fur, poor vision and walking around wearing basically clown shoes for feet, things can quickly go bad for them. This is why it’s up to us non-suiters to be aware of fursuiters and know how to act around them. Here are just a few tips to help you get ahead in interacting with fursuiters. Now that we’ve gone over the basics of getting prepared to physically go to a convention, it’s time to mentally prepare ourselves. For some of you this might be the first time that you’re going far away from home. Or it may be the first time in a social setting with many people of varied backgrounds and beliefs. Furries are a vibrant and colorful fandom, and when we get together at conventions we can really let our true selves show. For some that can be a bit overwhelming. 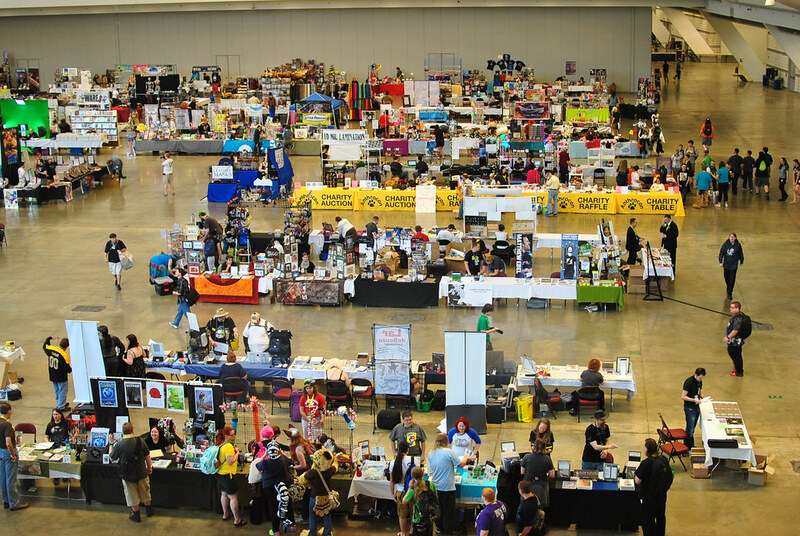 My first convention was a bit of a culture shock, but yours doesn’t have to be. These are just a few of the things that you may see and experience at the convention. None of these are intended to spook you, only to give you a heads-up of what to expect. Even before you plan for what panels to go to, who you’re going to see, or figure out where the bar is, one of the first things that you need to do when going to a convention is to figure out where the heck you are going to room. Three years ago I up and decided to go to Anthrocon for the first time just a whole two weeks before the actual convention. Not the dumbest decision of my life, but I was totally unprepared! If it wasn’t for friends bailing me out and offering me a room, I would’ve been completely in over my head. But I had a blast anyway and since then I’ve been to Anthrocon again and other conventions as well. While I’m still new compared to many who have been going to conventions for years, I’ve had to learn a lot in a short period of time. As I prepare for my third Anthrocon, I want to pass on what I’ve been learning to convention goers new and old.